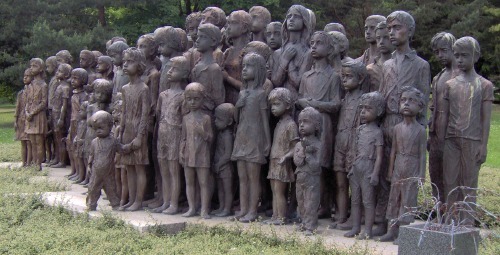 Most of the children singing in that opera were exterminated so the song brings with it the horror of foreshadowing, but also serves as an example of how, even in the most terrible circumstances, humans utilise the power of satire and art as forms of resistance. Later, we meet Pavel Stransky, a spritely 90 year old survivor not only of Terezin, but also of Auschwitz and the final death marches. Mr. Pavel begins his story with the words ‘this is not just a story of the Holocaust, but it’s also a love story.’ The day after a rushed wedding to his beloved Vera, having heard that he was named as being part of the next ‘tranport’, they were sent to Auschwitz. Vera had insisted on the marriage because only married couples could request to be sent on the transports with their partners. She would rather have gone with him than be left behind. Stripped of clothing, rings, possessions, even hair, they swapped, in the moments before they were separated, the only things they were allowed to own – their spoons. Pavel Stransky carried his spoon through the rest of the war as a symbol of hope that his wife would survive and that they would be reunited. Against infinitesimal odds they did survive and were reunited. But not before they had witnessed horror upon horror. Mr. Stransky was a teacher. He was placed in charge of blocks of children – firstly a block of boys, aged between 10 and 14, and once all they had been gassed, a block of younger children aged between 3 and 6. Almost all perished. He recounts stories of how the Nazis would allow the children to put on small plays and shows. How Mengele would even bounce them on his knee, telling them to call him ‘Uncle’ before sending them off to the gas chamber. In the face of that – a certain death – what is the role of a teacher? We had gone there, in part to create theatre. And I’ve always had a slight unease about creating theatre about the holocaust. Because I wasn’t there, partly, and I fear handling it clumsily or superficially. But Mr. Stransky once again, had words of wisdom. ‘Art’, he said ‘is resistance of the mind.’ And he reminded us of the incredible amount of art work, of poems, playscripts, magazines, stories and musical compositions, which were found hidden in the walls, under the floorboards and in the eaves of the buildings in Terezin on liberation. Most of the writers and composers were dead. Many of the artists were children – again, most of them dead. There, in that place, art became not just a form of transcendence, but a form of defiance and resilience. Art has the power to move, to improve. And so, the children with us, turned to art. They wrote songs with titles like ‘Love will sustain me’ and drew pictures. They chose significant moments from their tours and explorations of the sites and museums in Terezin and recreated them through dance and drama. There was no ‘audience’ – just an outpouring of learning and understanding through art. Their work was extra-ordinary. Outstanding, one might say. What is education for? We often trot out that we’re preparing children for a future. We have no idea what that future may bring. What experiences do we immerse them in, in order that they will be equipped to make better decisions than the generation before them? What power do we give them to shape their futures? What skills do we equip them with in order that, should they find themselves in a seemingly hopeless and despairing state, they can overcome, resist, find hope and persist? What access do we give them to the best examples of what we, as a species can be? What would our curriculum look like if we simply focused on giving them the best life that they could have right now instead of a deferred gratification system of examinations? I don’t know the answer, but I know that right at the heart of it I would put a new slogan: always be human. Next A Bad Academic. That’s me! Amazing Debbie. A humbling story which makes you realise how much responsibility we have to educate children in every sense of the word. Thank you Lucie – really glad you’re signing!